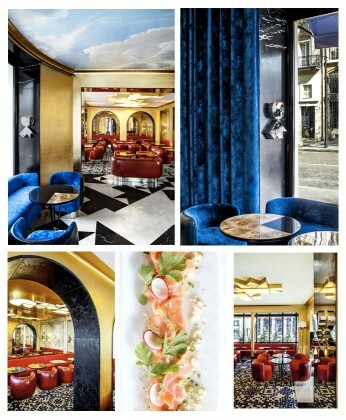 In a neighborhood that is not at all lacking in hotspots – even if they do not always live up to their reputation – here we have the “modern brasserie”, the latest venture by Gilbert and Thierry Costes. Known as tastemakers of trends, locations and talent, here the two brothers offer the best of the classics, but with some very strong modern accents. “Beautiful, just and good”, could easily be the official tagline for this place. The best products from the best suppliers are served up by Pascal Lognon-Duval (who was at Le Grand Véfour when it had three stars), under the guidance of Jean-François Trap (formerly of the Crillon, formerly of the Plaza Athénée, and also formerly of three stars). And to serve as a backdrop to this cuisine, a deceptively simple but extremely effective décor by India Mahdavi and studio M/M. Again, the finest materials have been selected to emphasize the radical lines, tempered by soft furnishings in tricolore colors, very à la Française. Upon arrival, the result is highly successful, as much in the setting as it is in form.